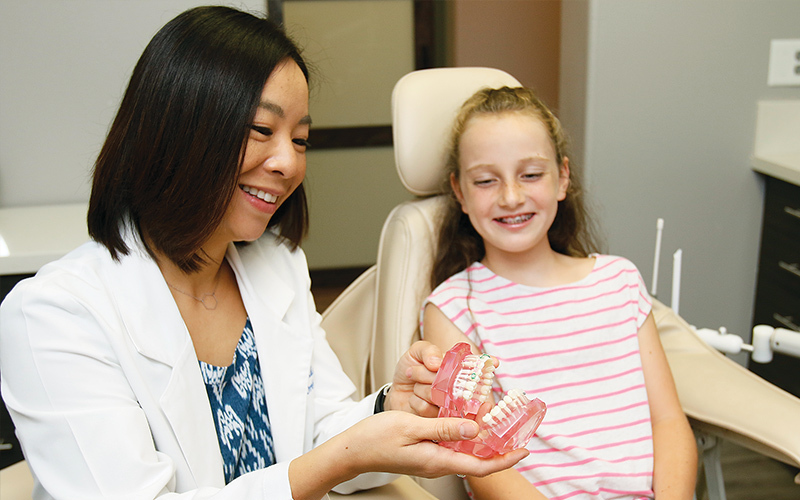 Having a board-certified orthodontist in-house enables us to provide adults and children with teeth straightening and regular dental care in one convenient location. Dr. DT Fields is a board-certified orthodontist. She provides both braces and Invisalign® to patients in need of teeth straightening. Thanks to her specialist training and expert skill, Dr. Fields can successfully treat even complicated cases. Orthodontics is the treatment of teeth and jaws that are positioned incorrectly. The word comes from Greek “ortho” meaning “straight” or “correct,” and “odont” meaning “tooth.” The orthodontist’s job is not just to straighten teeth, but also to make sure that the teeth come together properly. This is known as a person’s “bite.” Having a correctly aligned bite is very important, not only for aesthetics but also for proper chewing function and TMJ (jaw joint) health. Dr. Fields ensures that your treatment results in both a beautiful smile and optimum function. Dr. Fields is a board-certified orthodontist. She grew up in Pasadena and earned her dental degree at UCLA. She then went on to study orthodontics and received her orthodontic specialist certificate from USC, where she also earned her Master of Science degree in Craniofacial Biology. Dr. Fields enjoys providing her patients with beautiful, confident smiles and establishing lasting relationships with them. In addition to providing traditional braces, she is also an Invisalign® Preferred Provider. Call Whittier at (562) 693-0788 or San Clemente at (949) 234-0500 to schedule your complimentary consultation.